Feast Day for Our Guardian Angels! Who can possibly top our Guardian Angels for attentiveness, love, concern, and protection? Okay, mothers might come close but even though it seemed that they did have miraculous powers when finding out ‘who did it’ in our childhood, they didn’t! 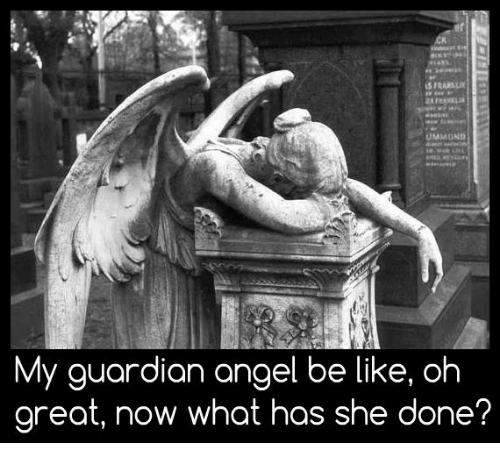 Our Guardian Angels do. I imagine the first thing God will reveal to those of us blessed enough to reach the foot of His throne will be to show us all the mishaps we avoided because of our heavenly friends. Praying to Our Children’s Guardian Angels . . . I humbly salute you, O you faithful, heavenly friends of my children! I give you heartfelt thanks for all the love and goodness you show them. At some future day I shall, with thanks more worthy than I can now give, repay your care for them, and before the whole heavenly court acknowledge their indebtedness to your guidance and protection. Continue to watch over them. Provide for all their needs of body and soul. Pray, likewise, for me, for my husband, and my whole family, that we may all one day rejoice in your blessed company. Amen. Beautiful Angel . . . Happy Feast of the Archangels!